With whole areas of the city being turned over to the pursuit of pleasure and traffic jams at 0400-0500 at the weekend, it is obvious that Lisbon is a city that takes its nightlife seriously. 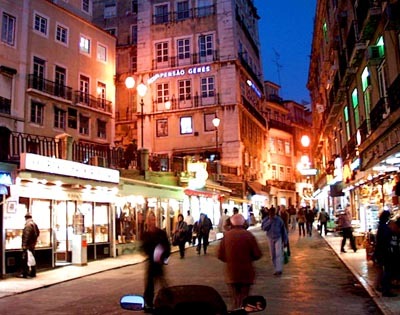 Traditionally the nightlife centre has been Bairro Alto, with its fado clubs, traditional, canteen-style bars and upscale discos. The simplest thing is to walk in and out of a number of them, ordering an imperial (half pint), or a caneca (pint) if the place looks especially inviting. The bars are open until 0400, often with lock-ins. The average price of a beer in Lisbon is Esc325/EUR1.50 and the minimum age for purchasing alcohol is 16 years. Much of the action has moved on to the Docas (Docks) district, just to the east of Ponte 25 de Abril. One bar after another occupies a row of converted warehouses at the Doca de Santo Amaro, with a crowded promenade and tables out front. Back towards the city, the Doca de Alcântara has emerged over the last few years as the new place of choice for Lisbon’s moneyed professionals and the ‘in’ crowd. At around 0200, many locals head to the multitude of Lisbon discos, which rock until 0600 or later. Some Lisbon clubs leave the cover charge to the doorman’s discretion and can be anything from zero to Esc1000-2000/EUR5-10 (often including one or two drinks). The Time Out website (www.timeout.com) is a good source of information on new bars, clubs and restaurants in Lisbon. Bars: Along the row of buildings east of Ponte 25 de Abril, you can take your pick of the competing bars, including nightlife delights such as the popular Celtas Iberos Irish Bar, Doca de Santo Amaro. Finding a place in Bairro Alto is a bit more complicated – the best thing to do is to walk uphill from the Praça Luís de Camões, just to the west of the Chiado metro station. Clube da Esquina, Rua Barroca 30, is a trendy, minimalist bar that is popular with the local cool crowd. Rua da Atalaia is one of the more lively streets and the welcoming Portas Largas, at number 105, is a good place to start. Arroz Doce, number 117-119, is a traditional canteen-style bar and a good place to order a pontapé na cona. Fátima Lopes, number 36, is a swish bar with funky sofas and dancefloor. Punters can also shop for the eponymous designer’s fashions until 0400. Work in Progress (WIP), Rua da Bica Duarte Belo 47-49, is a more laid-back place with exposed brick walls and ambient music. Casinos: Casino Estoril, Praça Jose Teodoro dos Santos, Estoril (website: www.casino-estoril.pt), is one of the largest and best known casinos in Europe. There is a charge of Esc500/EUR2.50 for the gaming rooms (excluding slot machines). Visitors must be over 18 years, wear smart-casual attire and provide ID. Clubs: There are a number of clubs around Doca de Alcântara. There is not a huge difference music-wise between them, although Kings and Queens, Doca de Alcântara, attracts boys and girls of all persuasions. Kremlin, Rua Escadinhas da Praia 5, and nearby Kapital, Avenida 24 de Julho 68, are both popular – the former plays techno in Egyptian-style surroundings, while the latter has three floors, each with a different style. Without doubt the city’s hottest spot is still the ultra stylish Lux, Rua Gustavo Matos Sequeira 42, which has been voted one of the best 35 clubs in the world and offers free entry. Top Portuguese DJs as well as big European names have been attracted by this classy club, which boasts a massive dancefloor and a chill-out area upstairs, with comfy sofas, two-seater bean bags and a terrace overlooking the river. Live music: Fado is a form of music that developed in Lisbon’s sailor bars in the late 18th century. It is a mournful, romantic singing style that fits somewhere between blues and flamenco and bemoans the death of Portugal’s great Golden Age. These traditional sounds are best heard at one of the casa de fado, from about 2100-2200. Hot Clube de Portugal, Praça de Alegria 38-39, is a favourite for jazz sessions. On Thursday, live jazz is also played at Catacumbas Jazz-Bar, Rua da Rosa 154. For African and Brazilian music, try Lontra, Rua de São Bento 157, in Bairro Alto, and Pê Sujo, Rua Madalena 102-8, near the Cathedral in the Alfama district. Large concerts can be seen at the Atlântico Pavilion, Rossio dos Olivais (see Sightseeing section).